I’ve written here about raising monarch butterfly caterpillars in the past couple of years. It’s even more exciting now that I have my very own milkweed plants and can watch the butterflies laying eggs in my yard and then bring the eggs inside to raise. It’s very satisfying to take them from egg to caterpillar to adult butterfly and then release them back onto the same plant where their lives began only a few weeks earlier. Recently I’ve begun trying to raise butterflies of the night (moths) as well. This wasn’t planned at all and I’m still learning on the fly, so to speak. It all began a couple weeks ago when a friend posted a photo of dozens of milkweed tussock moth caterpillars in her yard. I asked if I could take a few of them to raise and she was more than happy to oblige. I really only knew two basic facts about the moth life cycle: the metamorphosis of a moth takes place in a cocoon instead of the butterfly’s chrysalis, and they can stay in their cocoon for months rather than mere days. So when I arrived home with three fuzzy wuzzy caterpillars, I knew I had to quickly find out whatever I could about the needs of these guys so I could keep them alive. It turns out there’s not a whole lot of information available about the life cycle of this species. Or at least I couldn’t find much. I wanted to know how many instars they would go through so I would be able to predict the time when they would form cocoons. I couldn’t find that information, so I resigned myself to just keeping a close watch on them. I was thrilled to capture this video of one cat as he had just molted into a new instar one day. The black piece at the bottom of the screen is his discarded head capsule, and the fuzzy piece at the top is his old discarded “skin” that he has wriggled out of. I love seeing him writhing around getting used to his new larger body. It reminds me of how we stretch our arms and legs upon awakening in the morning to get the blood flowing. Or, in this case, the hemolymph (caterpillars don’t have blood). In this video, the action starts about 27 seconds in. I kept them fed with fresh leaves of common milkweed each day, and then one day I could only find two caterpillars in my enclosure. Hmmm, that was weird. I’ve had monarch caterpillars escape their enclosure before, but I couldn’t see how these big fuzzy cats could have possibly gotten through the tiny slits in the lid of the new container. Just in case, I searched and searched around the room but couldn’t find the missing caterpillar. I wondered, could the others have eaten it? I read somewhere that caterpillars will sometimes resort to cannibalism when they don’t have an adequate food supply. I’d fed them plenty of milkweed though. Just in case they didn’t like the common milkweed, I put two other kinds of milkweed in the enclosure. And the next day there was only ONE caterpillar! I think they must have been eating each other, although I can’t understand why. So now I had only one caterpillar left and I was worried. Would he starve for some reason because he wouldn’t eat the plant food? And what if he was ready to make his cocoon but I hadn’t provided him with the right conditions? I’d put sticks inside in case they needed to crawl up and hang from them. I’d also tried putting a couple inches of soil in the bottom of the container in case he needed to burrow under, but after a few days I noticed mold growing on the soil, so that had to go. I was screwing this up and felt awful about it. I finally made the decision to release the remaining caterpillar into my garden rather than keep him contained and maybe be responsible for his death too. It’s frustrating not knowing what happened, and I had hoped to be able to publish some information about raising this species to help other people who might want to do it. I guess this might at least serve as an example of what not to do. I’ve got some other moth caterpillars now, and I sure hope I get better results with these guys. About a week ago I was volunteering with our local metropark system, helping them remove large amounts of marestail (Conyza canadensis) from their native seed propagation field. 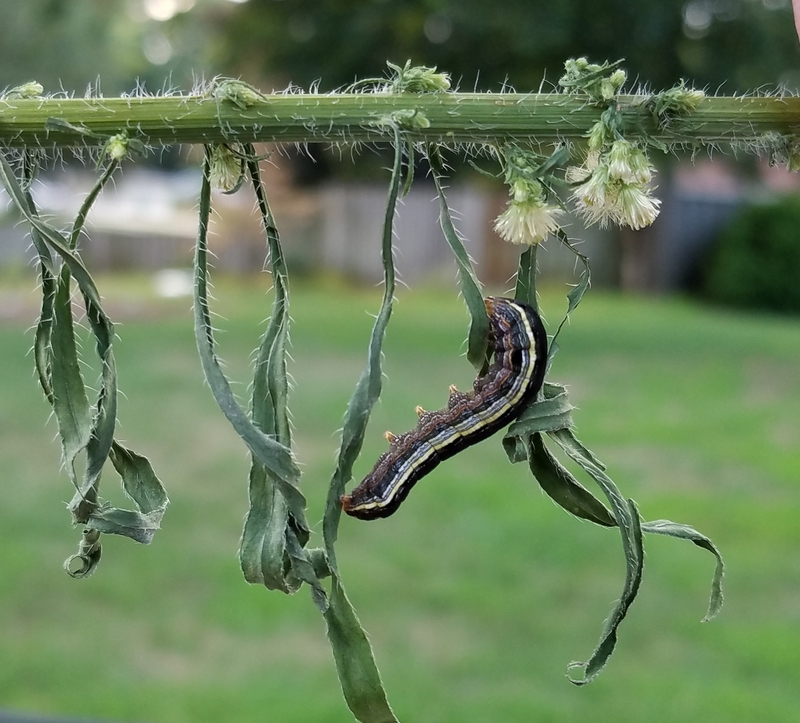 While doing that work I found quite a few interesting caterpillars feeding on that invasive weedy plant (which also grows in my own yard, by the way). 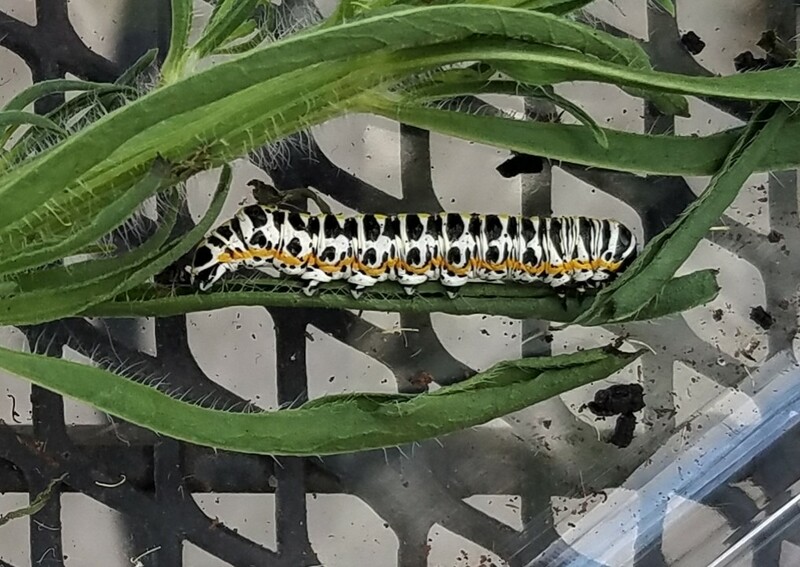 After asking permission, I brought one of them home, identified it as a Speyer’s cucullia moth (Cucullia speyeri), and began feeding it fresh marestail each day. A few days later I went back to volunteer again and got a couple more of the same species, as well as a couple yellow-striped armyworm cats (Spodoptera ornithogalli) that were also feeding on the same plant. I thought I had four total, and then one day I found another tiny one in the enclosure. It’s so easy to overlook the smallest ones; he probably hitched a ride on one of the plants I brought in as food for the other guys. And then I got another surprise yesterday as I was cleaning out the container, preparing to put in fresh marestail. This guy was also in there! This is a cabbage looper moth caterpillar, the first of these I’ve ever seen. It’s easier to understand how I missed him because he’s so well camouflaged against the green vegetation. I still worry that these guys won’t survive to make their cocoons though. And to be honest, someone in a mothing group online pointed out (rather snarkily) that the cabbage looper moth cats are considered agricultural pests and I shouldn’t be caring for this guy. Fair point, but I’m only going to raise this one as a self-education project; I’m not planning to raise hundreds of them. And with my moth track record so far, his chances of surviving with me are probably not much better than his chances if left outdoors. Here’s one more thing I have to worry about while raising these guys…cat vs. cat! That’s why I keep the caterpillars in their own room. I let Sam go in with me one day so he could satisfy his curiosity by sniffing around the enclosure, but quickly realized he could do some real damage by pawing at them. Out he went! And just this morning, as I was finishing up this post, I got a text from a friend asking if I’d like some Polyphemus moth caterpillars to raise. Um, that would be a YES! Click that link to see what a beautiful Polyphemus moth looks like. These other moths I’m raising are mostly rather drab after they emerge, but a Polyphemus…now THAT will be exciting. And luckily those guys can eat maple leaves, which I have an endless supply of. That will make my life much easier as I try to keep them fed until they make their cocoons. Stay tuned! This entry was posted in Insects and tagged caterpillars, insects, larvae, lepidoptera, metamorphosis, moths. Bookmark the permalink. What an amazing interest you have. I know I could not do what you do, but I do my best to take care of all that reside in my landscape. I loved reading this post! Thank you, Annie. I enjoy doing this but right now I think I have too many different species to manage and I’m not sure what I’m doing. I just found one of my caterpillars frantically running around the perimeter of his enclosure and I realized he might be looking for some place to burrow under. I put him in another container with some soil and he immediately dug down underneath the soil. 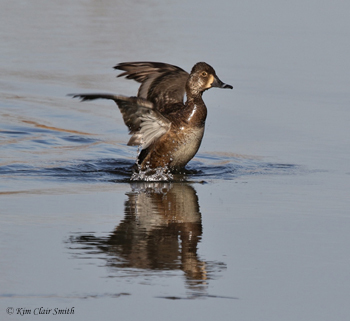 But after I finish with the ones I have now, I might stick to just one or two species at a time from now on, LOL. I must learn to say no when someone offers me cute little caterpillars. When doing research on insect husbandry, avoid websites for a general audience; even seemingly reputable ones are typically filled with falsehoods or are unhelpful. Thanks for that important reminder. I always try to evaluate the source of any information I find online. This has been a banner year of the monarch here, releasing 17. I presently have 6 left in chysalis. But what is most interesting is that all the cats were on my Butterfly Milk Weed, not one on the Swamp Milkweed, and they would only eat the leaves of the Butterfly Milk Weed, completely ignoring the leaves of the Swamp Milkweed. I think its fantastic what knowledge you are getting about raising moths as well as butterflies. Such an informative post Kim! Thanks, Marian. And I agree, it has been a very good year for monarchs. I see large numbers of them almost everywhere I go. And I just learned something important about the moths I’m raising — I thought they would all overwinter in cocoons, but it turns out one of the species will emerge in only a couple weeks! Very interesting and you are learning good information to help you know what to do. Too bad insects did not interest you as you were getting your degrees because you may have chosen differently. Yes, if only I could go back and get different degrees! Have had several of the Polyphemus moths in my yard over the years. Judging from their size, I’d have to believe the cats are quite big too!! I guess I’ll find out how big the cats are pretty soon, Barb! Right now they’re very tiny. Oh, Kim, I’m excited to see more on trying to raise a Polyphemus moth, which we occasionally see here (the moth). I know so little about caterpillars. I see a lot of varied species in my flower beds and vegetable gardens. I let them be. If they harm my plants I try to hand pick and relocate. We don’t use pesticide here. I really enjoy the information you put forth. I too understand your need to discover what went wrong. I do that with most everything that fails here… it’s how we learn and educate ourselves! Lori, I’m so glad you don’t use pesticides and that you attempt to relocate the caterpillars that are eating your desirable plants. You probably already know this, but many caterpillars can only eat specific plants, so it’s important to relocate them to something they can actually eat. My caterpillar field guide is really helpful in determining the food plants for each species. You are probably thinking of various pesty moths like Spodoptera and giant saturniids like the Luna and Cecropia.